Join SMDM for discounts on meeting and short course registration fees. Trainees enjoy deeply discounted rates on membership and meeting registration as do researchers from middle and low income countries. 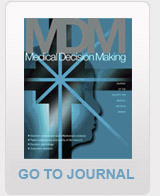 For SMDM purposes, undergraduate, graduate and doctoral students in clinical or non-clinical settings, and post-doctoral students, residents and fellows who are in academic settings qualify as trainees for discounted pricing. Faculty and full time research employees do not qualify as trainees. Trainees who register for the meeting must complete and e-mail the Trainee Verification Form to info@smdm.org in order to verify their Trainee status. - All fees listed are in US Dollars. - If you are paying by check, make the check payable (in U.S. funds) to "SMDM." Please write registrant's name on check. - Please see the Policies section below to view more information on meeting registration policies. Meeting registration fees cover the two and a half day general meeting from October 15 - 17, 2018 as well as the Sunday, October 14 evening Welcome Reception. Early Bird Deadline is 5 PM ET, Friday, September 21, 2018. SMDM members qualify for discounted meeting rates. Become a member of SMDM or renew your membership by selecting the Annual Meeting + Membership package and your membership will be honored through December 31, 2019. 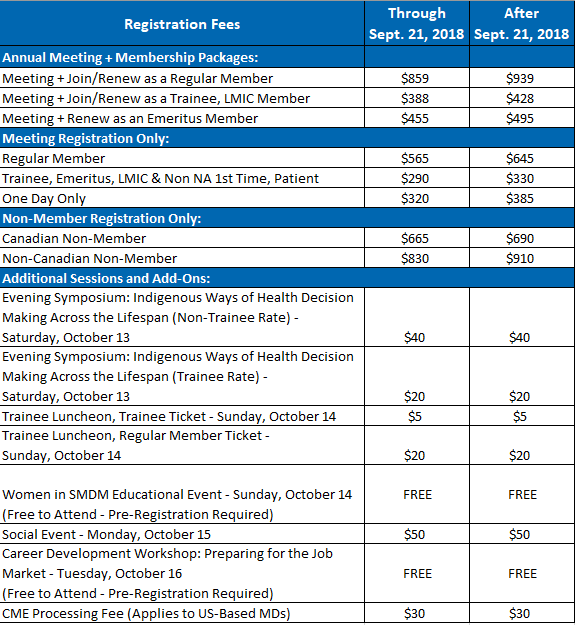 **Please note: Trainees, Emeritus, Low-Middle Income Country, First Time Non-NA and Canadian non-member attendees may qualify to receive special rates below. The office will verify registrants are qualified for these categories. **Please note all rates are in US Dollars. Click here to view the current exchange rate for US Dollars to all other currencies. Meeting Registration is not required to attend a short course; however, short course only registration will not grant you access to any other portion of the Annual Meeting. A full refund minus a $50 processing fee is available for written cancellations received up until Friday, September 21, 2018. No refunds will be given after Friday, September 21, 2018. Reimbursement will be issued in the form that payment was received. Please allow 4 weeks for reimbursements to be processed. All cancellation requests must be in writing, and may be faxed to 908-450-1119 or e-mailed to info@smdm.org. If you are having a colleague attend in your place, please notify the office as soon as possible. Please fax or e-mail your colleague's name and contact information for substitution. Note, if the substitute colleague is not a member, the non-member fee will apply. In the unlikely event that SMDM shall deem it necessary to cancel the conference, all pre-paid registration fees will be reimbursed. SMDM shall not be liable for reimbursing the cost of travel or accommodation arrangements made by individual delegates. Registration and attendance at, or participation in, SMDM's Annual Meeting, and other activities constitutes an agreement by the registrant to SMDM's use and distribution (both now and in the future) of the registrant or attendee's image or voice in photographs, videotapes, electronic reproductions and audiotapes of such events and activities. While these programs are designed to provide accurate information regarding the subject matter covered, the views, opinions and recommendations expressed are those of the authors and speakers, not the Association. By producing publications and sponsorship of this event, the Association does not guarantee the accuracy of the information disseminated and is not engaged in rendering professional advice; if such advice is desired, you should seek the services of a competent professional. Registering for and attending this event constitutes consent for the Society for Medical Decision Making to communicate with you via fax, e-mail, mail, text messaging, instant messaging, social media and to make you aware of its products and services. It is the undeviating policy of SMDM to comply strictly with the letter and spirit of all Federal, State, and applicable international trade regulations and antitrust laws. Any activities of SMDM or SMDM-related actions of its officers, Executive Committee Members, or members that violate these regulations and laws are detrimental to the interests of SMDM and are unequivocally contrary to SMDM policy. All content on the SMDM web site, such as presentations, algorithms, program code, text, graphics, logos, button icons, images, audio clips, digital downloads, data compilations and software, is the property of the Speaker or its suppliers and is not to be used for personal gain, publication, and cannot be used without referencing the Speaker and the source of the information. As property of the Speaker or its suppliers, it also cannot be used by others to obtain a patent or claim royalties.